The Clubman concept has the same front-end design as the new Mini hatchback with the bumper integrated into the grille but it uses more chrome on the front and rear lights and door handles. 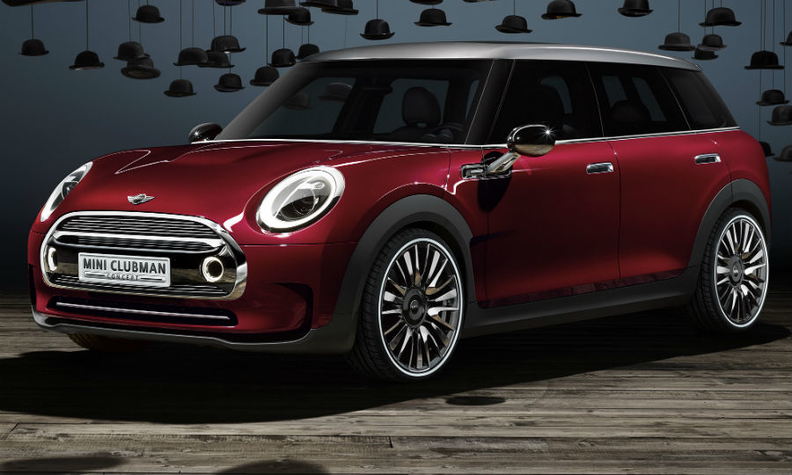 LONDON -- BMW's Mini brand will debut the Clubman concept at the Geneva auto show. The station wagon previews the iconic marque's longest and widest model to date. Mini is making the Clubman bigger and improving its practicality to boost its competitiveness against premium-brand rivals and its appeal to families. The concept is 260mm longer at 4223mm than the current Clubman -- almost exactly the same length as the Volkswagen Golf. It's also 170mm wider and 25mm taller than the current model. "The concept prepares the brand for entry to the compact premium class," a Mini spokesman told Automotive News Europe. The production version, due next year, is likely to look very similar to the concept. "Mini has a history of taking its concept cars to production largely unchanged," the spokesman said. 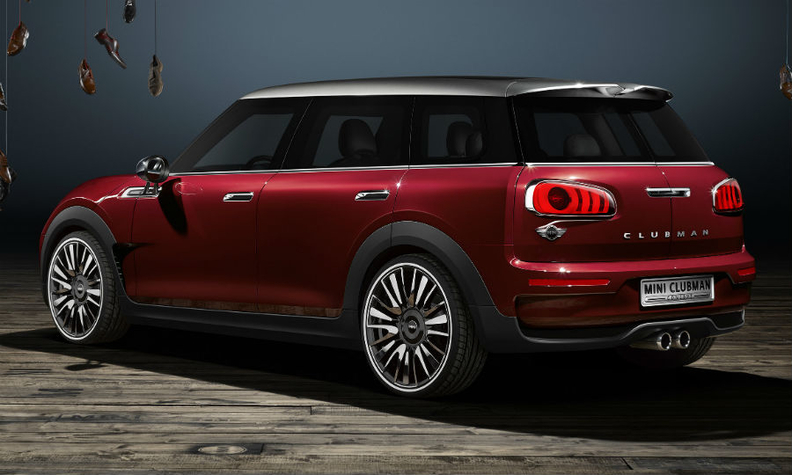 The Clubman five-seat concept has four doors instead of three in the current car. Sales of the current Clubman have lagged behind more popular Mini variants, partly because buyers haven't liked the quirky rear-hinged half-door that gave access to the rear seats. The concept keeps the twin side-hinged rear doors of the current car. Mini is improving the quality of the Clubman's interior and adding practical features such as storage pouches in the rear doors and a separate under-floor storage area in the trunk. The Clubman retains the twin rear doors of the current model. Natural materials are used to increase the premium feel, including leather, wood and seat coverings in tweed. "The Clubman Concept shows how the Clubman could be taken a step further: more interior space, a greater sense of high-end quality and yet still clever, bold and distinctive," BMW head of design Adrian van Hooydonk said in a statement. The Clubman concept keeps the same front-end design as the latest Mini hatchback, which is currently going on sale, but it does not have the new Mini hatchback's central instrument stack. The Clubman's engines are likely to be taken from the hatchback range, including BMW's new 1.5-liter turbocharged three-cylinder gasoline unit.